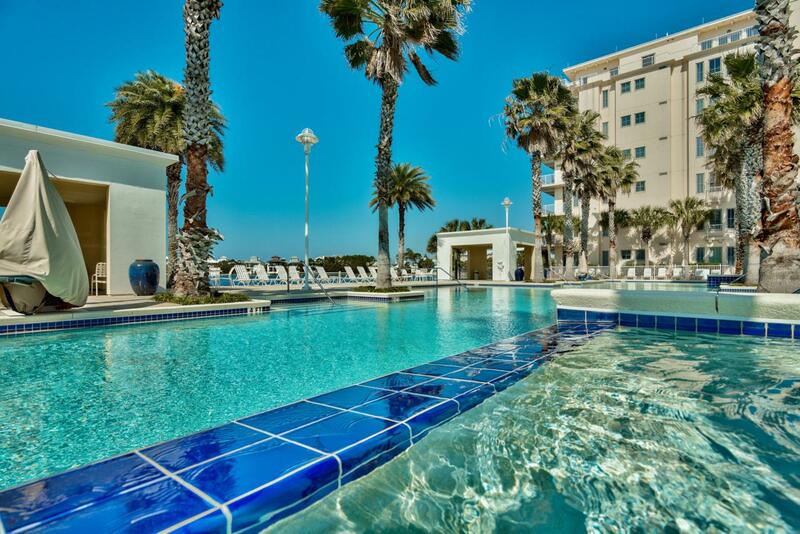 This one bed, one-and-one-half bath condo in a vibrant gulf-front community in Panama City Beach makes the perfect beach home or weekend escape and can earn its keep with vacation rental income when not in use by the owners. The gleaming hardwood flooring throughout the living area and the large outdoor patio make a great first impression. The white kitchen has everything you need for preparing breakfast or more ambitious meals with stainless appliances and glass-front display cabinets. Sliding patio doors provide ample natural light to the sitting room and cozy dining area. There's even room for a corner desk in the bay window. Step outside to appreciate the depth of this sunny outdoor balcony. There's ample room for entertaining, dining al fresco or relaxing on a swing seat and enjoyingthe balmy sea breeze. Stairs lead up to the generously proportioned bedroom which has ample space beneath the eaves for storage or using as a den. The ensuite bathroom is half-tiled with a bathtub for leisurely soaks beneath the skylight. The Carillon Beach community has a landmark bell tower in the gardens and paved walkways leading down to the private beach access. Nothing beats that first glimpse of sugar-white sand and sparkling emerald gulf waters. Look forward to invigorating morning walks, relaxing in the sun, swimming and enjoying all the benefits of life at Carillon Beach. The self-contained community has well-maintained gardens, a beachfront pool, fishing pier, tennis and a selection of local shops and restaurants. Nearby Lake Powell and Camp Helen State Park offer further recreation for walkers, boaters and outdoor enthusiasts.